The consultation is the first phase of the design process. We will meet with you in your home, for as long as it takes, to discuss your ideas and needs, answer all your questions, and come up with some general concepts for each of the various projects you are interested in. We are interested in getting to know you and your family, so that we truly understand what it is that will bring you the most fullfillment from your landscape. Pictures are great in helping to convey ideas and intents. We encourage you to have photos handy and we will likewise bring an extensive collection of pictures for inspiration and reference. Besides coming up with some general concepts, we will also follow up by email to answer additional questions, provide specific plant lists for each area, and provide estimates for 2 to 3 of the projects discussed. Following the consultation, our designer will also spend additional time taking photos, assessing drainage, soil structure and type, measuring elevations, observing existing species and wildlife, and getting a further "feel" for the property. 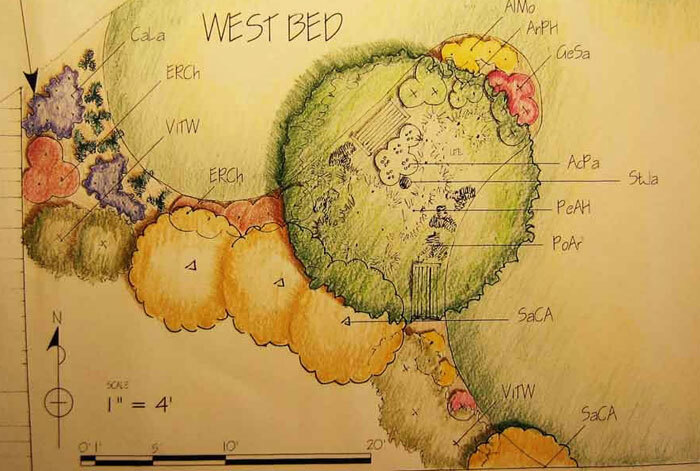 We can use the general concepts discussed in the consultation to come up with a suitable palette of plants, load the truck, and have the designer meet the gardening crew on-site to arrange the plants in an impromptu design. This works well for smaller areas, and projects that are involve one or two different areas. Before the installation, we can correspond by email and phone, using un-scaled sketches, photos, and altered photos of your property to agree on the general scope and look of the project. 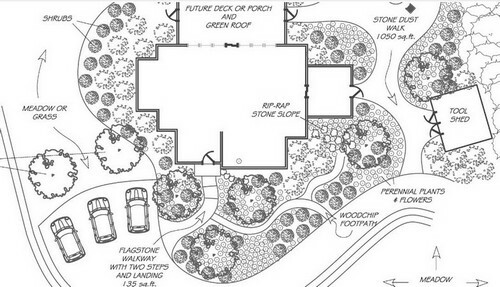 For projects involving multiple phases and areas, we often recommend a scaled drawing of the property (or area of focus) which will show how all of the phases and areas will work together to address specific issues such as traffic flow, visual continuity, views blocked or allowed, drainage, usage of space, and garden type. Once we have a scaled base-map of the property it is fairly easy to sketch in the exact shape of the garden beds, patios, walks, and other structures. If we provide generic descriptions of each area (eg. "woodland shrubs and perennials") we can use this more detailed approach in combination with approach #1 to fill in the exact plant layout on-the-spot and as we go. fees may vary depending of complexity of property. if you can provide a scaled plot-plan (many homeowners have these already) it can help cut our surveying time and costs. If you feel the need for a futher degree of control over the project, we can create a scaled plan which includes specific plants, layed out in exact scale. This may also be a preferred approach when you are planning to install the garden yourself and are unsure how to best place the plants and which plants to pick. Costs for this type of design are generally about 30-50% higher than the previous design method.